Join the Approved Boats Team Today to Connect with the Best in the Marine Industry! Approved Boats are currently looking to recruit an experienced and well-organised boat valeter for an immediate start. The successful candidate will be experienced in valeting to a showroom standard and will carry out all aspects of valeting at a busy site where we pride ourselves on achieving the highest levels of customer satisfaction. This is a physically demanding role where you will be responsible for ensuring that all vessels are cleaned to the highest standard. This is a permanent, full time position working in a small, highly motivated team. Maintain clean and presentable boats and equipment on the sales areas and ready boats for delivery to the new owner. You will require a full driving licence and be prepared to work overtime when necessary at peak times. In return we offer good rates of pay, entry into the company pension scheme and good working conditions. Interested? Does your experience match our requirements? If so, don’t delay apply today! Approved Boats are searching for a Sales Professional to help us meet demand during this exciting time as our industry continues to grow at an increasingly faster pace. To meet the demand and to maintain the Approved Boats reputation for excellence, we are seeking a talented, dedicated and energetic individual that is experienced in a retail operation of consultative sales and motivated for success. Our offer is simple; excellent compensation & benefits packages, premium brand product lines for every customer, and cutting edge tools to provide you with the support you need to reach new heights in your career. If you have achieved excellence in your sales career and are ready to go even further, we invite you to get in touch. 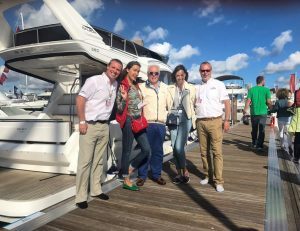 You will require a full driving licence, be prepared to work overtime when necessary at peak times and attend boat shows in the UK and abroad. In return we offer good rates of pay and commission, entry into the company pension scheme and good working conditions. Approved Boats are searching for a Brokerage Consultant who will produce profit through the brokerage of used boats by demonstrating the scope, presence and professionalism of approved Boats in the marine industry. The Brokerge Consultant must recognise that business is built on customer satisfaction and devote themselves to exceeding the customer’s expectations. Implement daily program to improve selling principles, including prospecting for new customers and follow-up on customers previously contacted. Approved Boats are searching for a Trainee Sales Professional to help us meet demand during this exciting time as our industry continues to grow at an increasingly faster pace. To meet the demand and to maintain the Approved Boats reputation for excellence, we are seeking a talented, dedicated and energetic individual that is experienced in a retail operation of consultative sales and motivated for success. Foster team building and inter-company member support. Approved Boats are currently looking to recruit an experienced and well-organised Marine Service Technician for an immediate start. The successful candidate will be experienced in carrying out all aspects relating to the service and maintenance of boats both afloat and ashore. This is a physically demanding role where you will be responsible for ensuring that all vessels are maintained to the highest standard. This is a permanent, full time position working in a small, highly motivated team. The Marine/Service Technician is responsible for the repair and overhaul of boats, machinery and trailers. Perform mechanical repair work such as: – remove engine, transom or outdrive – disassemble unit and inspect parts for wear – overhaul or replace carburetors, blowers, generators, distributors, starters, pumps, electrical and fuel systems – rebuild parts such as engine cylinder blocks – rewire ignition system, lights and instrument panel – replace and adjust lights – install and repair accessories such as radios, heaters, mirrors, waste systems, and electronic equipment. You will require a full driving licence, be prepared to work overtime when necessary at peak times. In return we offer good rates of pay and commission, entry into the company pension scheme and good working conditions.